This article is a short summary of Yoshi's Universal Gravitation. 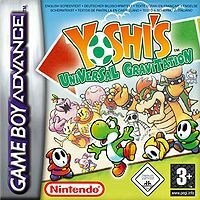 Yoshi's Universal Gravitation, also known as Yoshi Topsy-Turvy in North America, is a platform game developed by Artoon, and published by Nintendo. The game focuses much on utilizing the tilt-sensor from the cartridge.